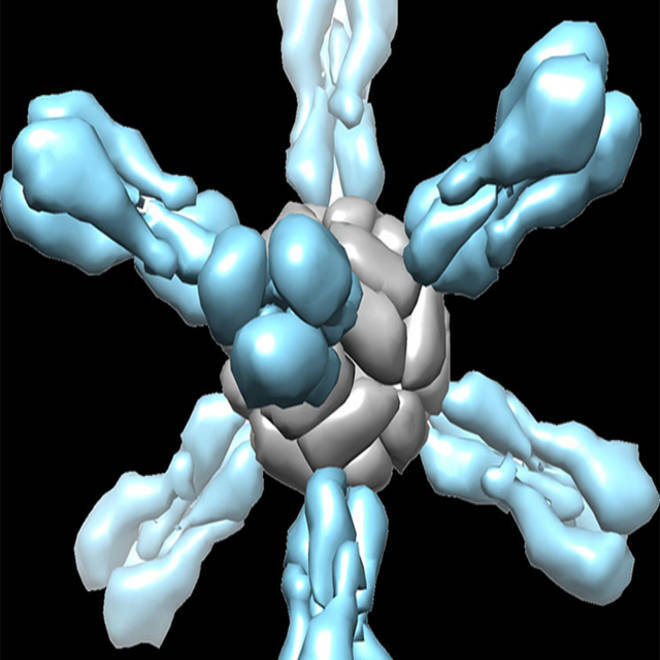 A new flu vaccine is made out of self-assembling nanoparticles. This images shows what the particle looks like - to the immune system, it looks like a flu virus. Researchers have developed a “stripped down” synthetic flu vaccine that they believe will not only work better than current vaccines, but might last longer, too -- saving people from having to get a fresh flu shot every year. They say it’s the first step toward a new generation of influenza vaccines, designed entirely in the lab, using nanoparticles instead of the decades-old approach that uses chicken eggs. The nanoparticles assemble themselves into an imposter of the flu virus -- one that seems to excite the immune system far more than the real thing. “This is, I believe, an important advance,” says Dr. Tony Fauci, head of the National Institute of Allergy and Infectious Diseases, where the research was done. Current flu vaccines are clunky at best. Most are still grown in eggs, an uncertain technology that takes months. Entire factories full of vaccine can be shut down because of contamination. Researchers have figured out how to make synthetic versions of the flu virus to use as a basis for the vaccine, but many still use real viruses, either killed or weakened so they don’t make people sick. And it’s never certain from one year to the next how well the vaccine will work. No one is precisely sure why, but the virus mutates every year, and a variety of strains circulate at any given time. The result is that some years the vaccine protects people well, and in others, it doesn’t. For instance, this past season’s influenza vaccine reduced the chances of illness by just 9 percent in people older than 65, the Centers for Disease Control and Prevention says, and reduced illness for the population as a whole by 56 percent. And then every few years, a new strain pops up to infect people. Health officials are currently keeping a wary eye on two strains of bird flu, H5N1 and H7N9, either of which could mutate just a bit more to cause a pandemic. The new vaccine uses a key part of the flu virus, called hemagglutinin, which gives flu the “H” in its name. Dr. Gary Nabel, who was at NIAID at the time, fused a bit of hemagglutinin to a piece of a compound called ferritin. Ferritin naturally makes itself into little nanoparticles, and the result was a nano-sized spiky ball that looked a lot like a natural bit of hemagglutinin. Nabel says it’s a stripped-down version of flu virus that the immune system recognizes even better than it does real flu. Tests on animals showed the nanoparticles caused the body to produce 10 times as many virus-fighting antibodies as the current seasonal flu vaccine, Nabel’s team reports in the journal Nature. “They look like flu. They react with antibodies like flu,” Nabel, who now works for vaccine maker Sanofi, said in a telephone interview. The vaccine protected ferrets against H1N1 flu viruses, an H3 flu virus and an influenza B virus, too. Ferrets are the animals that react most like humans to flu. Now researchers are working to make a version that can be tested in people. Nabel thinks the vaccine will provide broader immunity than current vaccines, as well as a stronger immune response. But humans have unique immune systems and it’s not yet clear how it will work in people. It may also speed up the convoluted process for making vaccines, which starts with growing the virus in the lab, something that can take months. “We don’t need the virus to replicate. We just put the gene into a cell and make the particle. It is rather an amazing process,” Nabel says. “In theory it could be very fast.” If it takes three months now to make a “seed” virus for a vaccine, the new process would only take a week or two, he estimates. It took months to make and roll out vaccine against H1N1 swine flu when it first broke out in 2009 and thousands of people died during the delay. CDC doesn’t count how many adults die from flu each year, because it’s so variable -- anywhere from 4,000 to 49,000 a year. The new technology might not just work against flu. “This is a platform that could be used for other viruses,” Nabel said. That could include the AIDS virus or herpes, or even coronaviruses like the new MERS virus that has killed more than 20 people in Saudi Arabia and other middle east countries. Dr. John Treanor, a flu vaccine researcher at the University of Rochester Medical Center, said the approach resembled some newer-generation vaccines that use synthetic technology and that have been shown to work in people. “It certainly is a very technically advanced approach,” said Treanor, who was not involved in the research.